오늘 아침에 우연히 발견한 글을 읽고 감동해서 회사와 제품 정보를 좀 찾아보다가 블로그에 메모. 매트리스를 만드는 스타트업에 대한 이야기다. 미국에서 매트리스를 사본 경험이 있다면 십분 공감할 스토리. 나도 매트리스 살 때 참 답답함을 느꼈고, 사고 나서 며칠 후 후회해도 소용 없게 되자 그 큰 매트리스를 처분하기도 힘들어서 고통을 겪어본 적이 있다. 좋은 걸 사자니 수천달러 이상이고, 값을 절약하자니 너무 안좋아보이고. 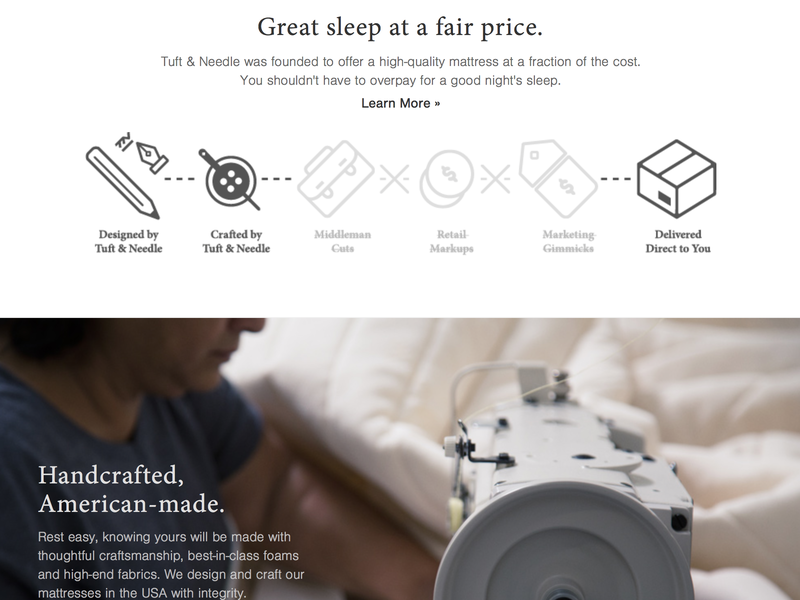 다음은 How Tuft & Needle Disrupted a Tired Mattress Marketplace (Tuft & Needle이 어떻게 해서 지겨운 매트리스 시장을 Disrupt시켰는가)라는 제목의 기사인데 몇 가지 대목을 정리해본다. 창업자 중 한 명인 JT는 원래 실리콘밸리 스타트업 엔지니어. 결혼한 지 얼마 되지 않아 온라인에서 매트리스 사려고 알아봤는데 분석적 방법이 먹히지 않았다고. 엉터리 정보들만. In 2011, newlywed John-Thomas (“JT”) Marino ran headfirst into the mattress-buying morass. 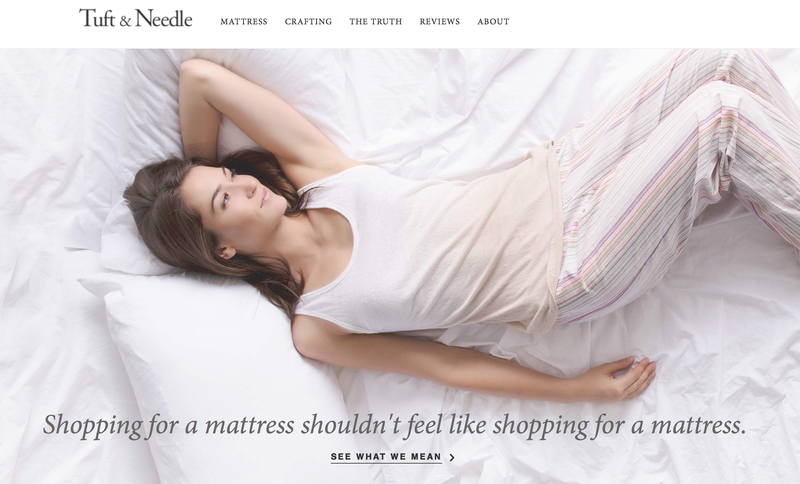 An engineer at a Silicon Valley startup, Marino took an analytical approach, intending to dissect the process of making his purchase before ever entering a mattress store. Things didn’t go well. 그래서 가게에 방문해서 알아봤는데 똑같은 매트리스에 브랜드만 달리해서 팔고, 똑같아 보이는 매트리스가 500달러 가격 차이. When he visited mattress stores, things only got murkier, as commissioned salespeople appeared to be putting up smoke screens. “My objective was to learn the brands and compare features and models,” Marino says. Instead, he found that the same mattresses were often rebranded for different stores, or small tweaks were made to differentiate them. Some seemed to be identical, but one cost $500 more than the other. There was no real way to compare and contrast. 결국 3000달러를 들여 매트리스를 샀는데, 몇 주 써보고 나서 후회. 반납하려니 너무 비싸서 결국 쓰게 됐는데, 밤마다 자신이 실수했다는 사실을 상기한다고. In the end, Marino spent more than $3,000 on a mattress. After a couple of weeks, he was ready to return it, but shipping costs were prohibitive. “I settled on this thing, and every night it just reminded me of my mistake,” he says. 그래서 같은 회사에서 일하던 Daehee Park (박대희)를 만나 6000달러 투자해서 창업하기로 결심. Armed with that knowledge, Marino and Park left their jobs in June 2012 to work on their new venture full time, investing $6,000 and renting work space in Tempe, Ariz. They launched Tuft & Needle in December that year. 아마존에서 팔았는데 처음엔 반품이 많다가 지금은 반품이 1% 미만. 고객이 매우 만족. 2013년 한 해 매출 10억. 2014년 첫 세 달 매출 10억. 이 추세라면 기사가 나가고 난 지금은 매달 매출 10억씩 올리고 있을 듯. Today, Tuft & Needle’s mattresses, which are made of 1.9-pound density foam–similar to more expensive foam mattresses–are the top-rated product in Amazon’s furniture category. Marino and Park are not sharing unit sales numbers, but they report that overall sales in 2013 hit $1 million. The company, which now employs 13 staffers, reached $1 million in sales in the first three months of 2014 alone. 먼저 회사 홈페이지를 살펴봤다. 좋은 느낌의 첫 화면. 그리고 들어가면 자신들이 어떻게 해서 비용을 절감하는지 설명하고, 그리고 매트리스를 미국에서 만든다는 사실을 강조하고 있다. 30일 이내에는 이유 불문하고 반품 가능. 반품 비용은 전액 회사 부담. 아마존 판매 페이지를 보고 깜짝 놀랐다. 별 다섯 개 만점. 그동안 아마존에서 수백 개의 제품을 사봤지만 이렇게 별 다섯 개가 꽉 차 있는 건 처음 봤다. 그정도로 만족도가 높다는 뜻. 이런 정도 리뷰면 의심할 여지가 없다. 가격도 착해서, 트윈 사이즈는 배송비 포함해서 200달러. 다음번 매트리스는 여기서 사야겠다. 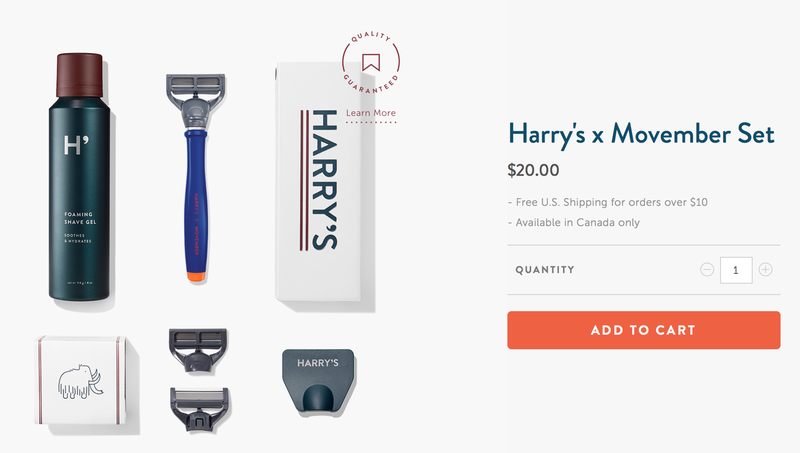 이 회사를 보니 전에 내가 좋아했던 또 하나의 회사 Harry’s가 떠오른다. 100년 묵은 면도기 시장을 개혁해 보겠다며 나타난 스타트업. 너무나 예쁘게 디자인된 면도기 세트가 20달러. 면도기 날은 독일에 있는 1920년부터 운영했던 공장에서 만든다. 이 회사의 창업자는 그 유명한 워비 파커의 공동창업자 중 한 명. 이렇게 전통적인 산업 분야에서 혁신을 통해 기분 좋은 사용자 경험을 제공해주는 회사들이 좋다. 진심으로 이들이 잘 되었으면 좋겠다. 매트리스 구입하는 것이 정말 쉬운 일이 아닌데, 유용한 정보 감사합니다.